LAPORTE COUNTY, Ind. (WLS) -- A man killed in a semi truck crash Monday afternoon on the Indiana Tollway in LaPorte County has been identified. A 38-year-old Florida man driving a semi truck carrying brownies was stopped in the eastbound lanes of the tollway due to construction ahead that reduced lanes from two to one, near Wozniak Road. 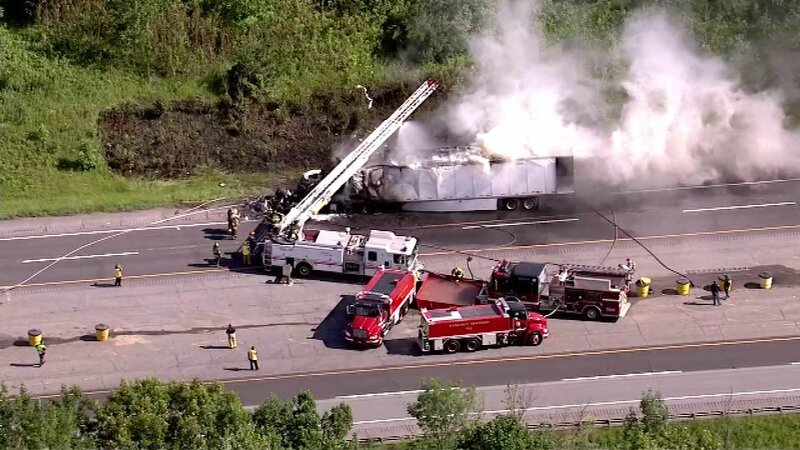 Police said at about 3:15 p.m., a second semi truck driver failed to slow down and rear-ended the semi carrying brownies, which was traveling from Joliet to Maryland. The second semi caught fire and became engulfed in flames, trapping the driver inside. The driver has been identified as Kwame L. Lawson, 36, of Calumet City, Ill. He was pronounced dead at the scene. The semi that caught fire was carrying paper products. The driver of the first semi sustained non-life-threatening injuries. Lanes were closed for several hours Monday.